Pine needle management made easy. Whether you want to rake them up or bale them up, this Rake can help you get all of those pine needles in one place. Large 12" pneumatic tires help it glide over any type of terrain and the 24 spring steel tines sweep the landscape to remove the needles as you go. After you have gathered them up, simply use the easy-to-use handle to drop your collection off in your desired location. What you do with them after that is up to you. A simple way to cover a lot of ground effectively. Gathering up your needles just got a whole lot easier. Hop on your ATV, UTV, or lawn tractor, hook this up, and get your project done, so you can relax and watch the sunset with a cold one. Clean up those pine needles, without breaking the bank! Order today! Pine Straw 5 Rake is rated 3.6 out of 5 by 18. Rated 4 out of 5 by jack from wanted it to rake leaves, to do so I put 1/2" hardware wire on the forks and added about 20lbs wt.works good for leaves now. Rated 4 out of 5 by Luapsaw from NeedsIimprovement I read reviews on this product before purchasing. I was aware of it's short comings but felt I could work with it and make it work. First the box came broken open (see photo). There were no parts missing but would suggest putting an additional strap lengthwise to help prevent this. Assembly instructions were good and I was able to assemble it in about 1 hour. To address the dump handle position problem I made an angle Iron frame bolted to existing holes to move the handle 12" to the right. I replaced the chain with a turnbuckle to help with finer adjustment and to help put downward pressure on the rake. One of the hooks on the chain had started to straighten out after just one 5 min. trial. I found the small bolts used to assemble the handle very soft and stripped one. I put a spacer in the hitch pin because I found that the hitch moved up & down about and inch causing the rake to dump some needles. The hitch plate on most lawn tractors is about 1/4" and this was made for about 1 1/2" thickness. My next improvement is to add some weight attached to the area where the tines are attached by replacing two of the bolts that hold the tines with longer bolts. I am writing this in hope future versions will incorporate some or all of these improvements. I feel it can be made to work very well and am happy to share my experience. Rated 1 out of 5 by Buddy from Very good price Easy assembly. Last rake like this made differently but agrevating to use. This is a very good buy and works wonders for me as I have a large yard with pine trees. 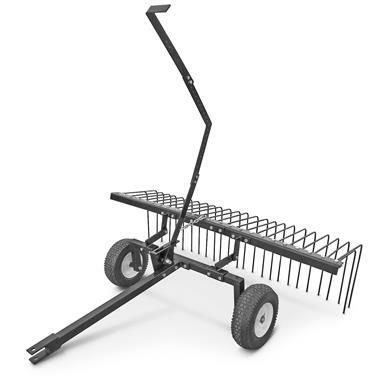 When using my old rake i always had to get off the mower and pull straw where as this rake just lift it up and straw falls off without getting off the tractor.A great buy for the price. Rated 3 out of 5 by Andy76 from I have not had a chance to use this rake, since two parts were missing when I received it. I called the day it came, and I am still waiting for it over a week later. Needless to say, I am not very happy right now. It looks like a quality rake. Rated 2 out of 5 by Mojo from Disappointed so far Was hoping this implement would solve my pines straw raking problems but... As others posted instructions were sadly lacking. I also had to remove 30-40 bolts to get installation right. Handle is positioned in awkward spot. Rake is light and didn't pick up well. I am going to add weight to it to see if that helps. I hope so. I need it to perform as advertised. Rated 4 out of 5 by Junior from Shows promise Had all of my needles raked before arrival. However, it seemed to work well on a neighbor's yard, after high grass was mowed. However, needed to add weight, so device should have a tray or something to make adding weight, e.g., cinder blocks, easier. Also needs a better lifting scheme, preferably off-center. When used as designed, lift handle hit me in the back when rake was lifted, yet was too far to reach when down. So, reversed the middle arm and tied a rope to it. Will be working to modify it some more. Rated 3 out of 5 by Haze from TERRIBLE INSTRUSTIONS All the reviews are absolutely correct about the instructions being terrible. Like nothing in the instructions says the front bar with the ring has to go in the middle for the chain lift. You find this out when you got all some 50 bolts in the wrong way. Also, all bolts are 11/16 and no store stocks them when you find out that you are short a couple of lock nuts that don't have thread in them. Only be good on large items. Rated 2 out of 5 by mike1111 from assembly causes anger, could be a much better design I did a basic test pulling with riding mower after I completed assembly. For use I think it will function adequately for larger debris. As other reviewers have stated it needs weight added. My big grip about this is the engineering and assembly. The handle is almost useless. There a ridiculous amount of bolts. Every single piece requires a bolt and lock nut including each individual "rake". The rake has two metal 90 degree halvs that are bolted together using a metal piece. The rakes are held on by 3 pieces of metal along with the bolts. I think this product could have been designed a lot better without much effort. The directions are terrible. A couple of pictures and bolts are not labeled. I assembled the rake improperly and had to disassemble all 30 or 40 bolts to fix my error. I think this product is worth about $90.00.